These are ready to use professional grade airbrush colors which are manufactured with the highest quality control standards. Createx uses the finest pigments available and the colors have a brightness and richness unmatched by others. These colors can be used on a variety of surfaces (i.e. fabrics, leather, canvas, paper, wood, ceramics, and clay) with permanent results. 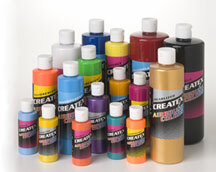 Createx Colors also produces airbrush additives and mediums which allow artists to "customize' the colors for specific applications. Transparent, Fluorescent, and Opaque Colors are available in: 2 oz., 4 oz., 8 oz., and 32 oz. Pearlized Colors are available in 2 oz. Click here for other sizes.